Back in the old days, almost every website had a sitemap where they listed out all the pages. The purpose of the sitemap is to help visitors and search engine spiders to find information on the site. Now, a lot of modern websites have dropped the sitemap page, instead they place the sitemap in the footer area. I’m going to review 20 websites (from big corporation to small portfolio sites) who organized their footer cleverly to enhance usability. As you may know, online readers don’t read everything on the page, they scroll and scan. Footer is probably the last place they look at before exiting. Placing a sitemap in the footer may attract readers’ attention and increase page clicks and views. Sometimes your visitors might be too lazy to click on the sitemap link or miss it all together, having a sitemap in the footer can ensure your visitors are aware of every page. You don’t really have to use the footer to list out everything, you can use it as an alternative location to promote important pages. Having a sitemap in the footer allows users to quickly jump from page to page. By placing the sitemap in the footer rather than a separate page, you save the visitors a click. Don’t know what to put in the footer? Perhaps a sitemap can fill up the page and make your site look bigger. Digg keeps their header nice and clean by placing only the content categories. The header is focused on the users while the footer is focused on the company. 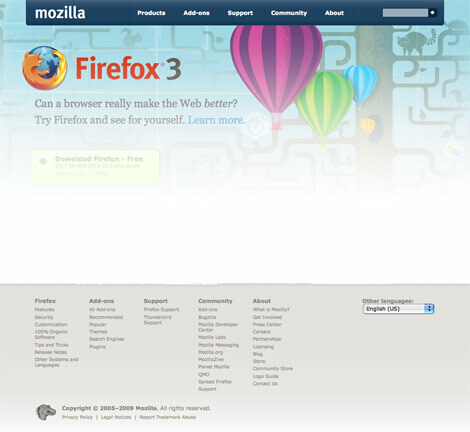 Thanks to the footer sitemap, with just a glance, I know exactly what pages are available on the Mozilla website. What if you have a huge website (in terms of content), putting a full sitemap in the footer may be insane? 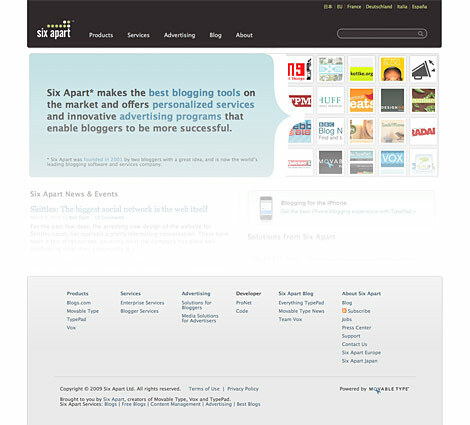 You can learn from the clever Apple.com, split the sitemap into sections. For example, go to the Mac section, you will only see the Mac sitemap. Although GoodBarry doesn’t list out every page in the footer, but it does act as a sitemap where they list the pages with the most significant content. 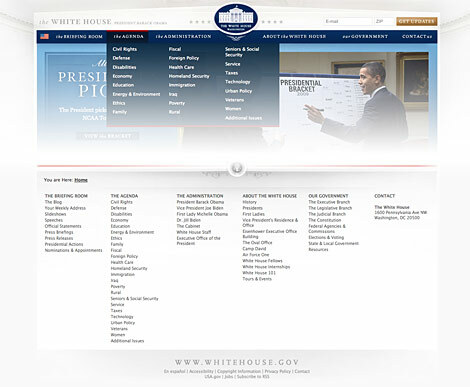 In the recent redesign of the White House website, browsing the site has been made easier by using the dropdown menus and sitemap in the footer. 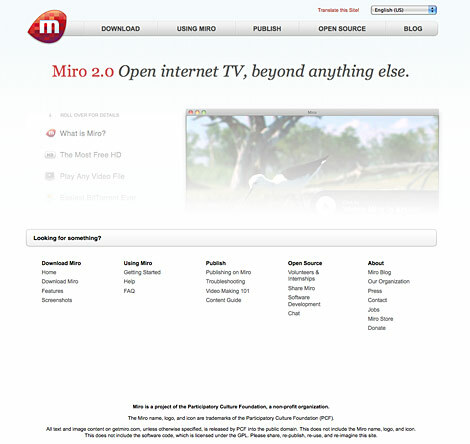 Miro separates the sitemap with a text bar “Looking for something?”. You may also use the sitemap to connect to your network sites. Six Apart is a good example. 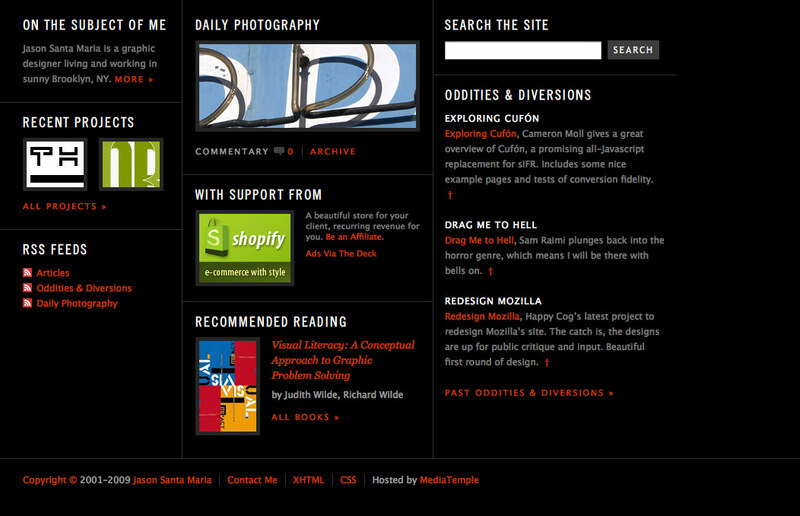 In the footer, under the Six Apart Blog column, there are links to their sister sites: Typepad, Movable, and Vox. 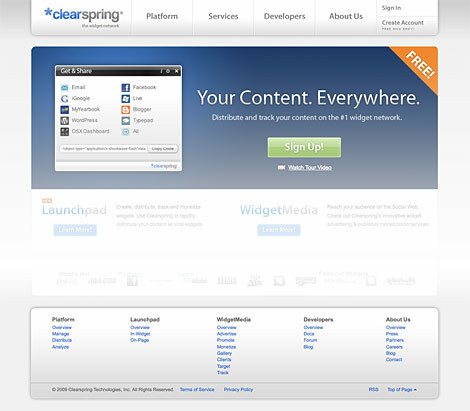 In Clearspring, they split their Services section into two columns: Launchpad and WidgetMedia. 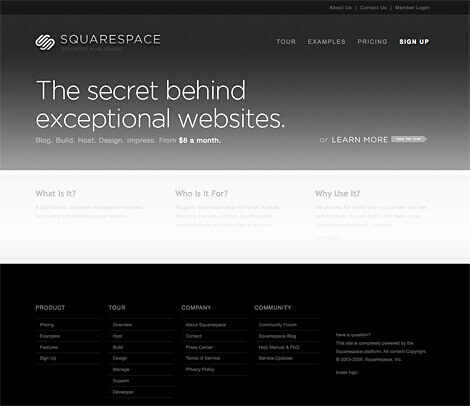 SquareSpace’s sitemap tells you which pages you’ve visited already. Notice the visited pages have a tiny check mark instead of the regular triangle icon? 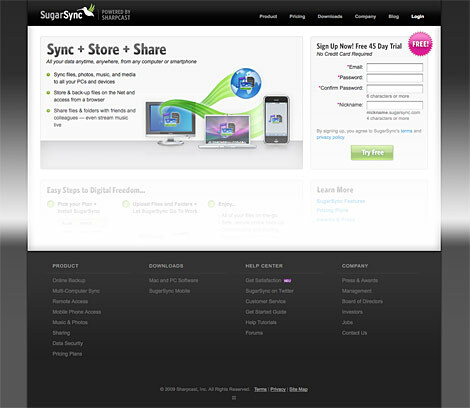 SugarSync displays only the main level of the site in the footer, the full sitemap lists all pages. 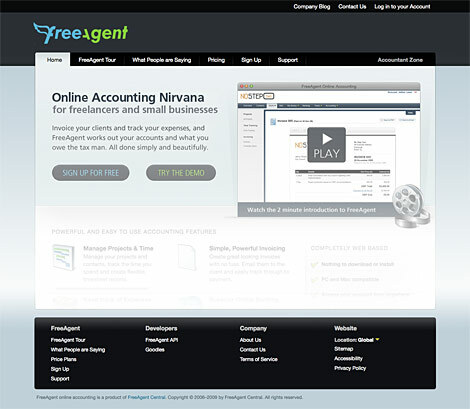 Again, FreeAgent Central has a simplified sitemap in the footer with a link to the full sitemap. FiveRuns creatively organizes their sitemap to put the main focus on their products. 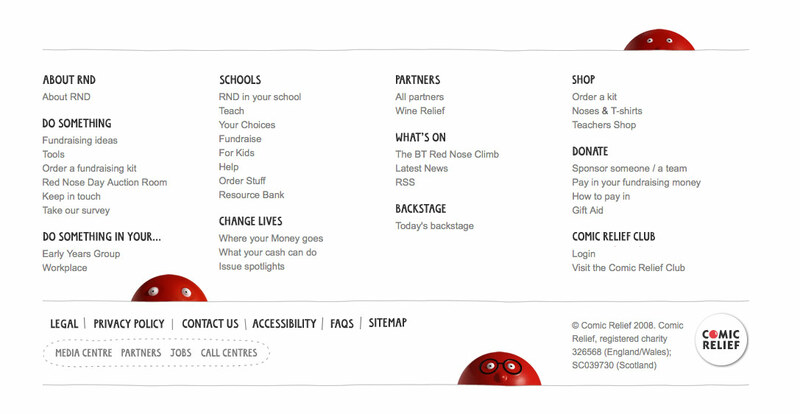 I particularly like the "red nose" figures in the footer because they make the sitemap stand out. Having too much empty space in the footer? Fill it with a sitemap. You don’t need to have a lot of pages to make a sitemap (Tigers is an example). 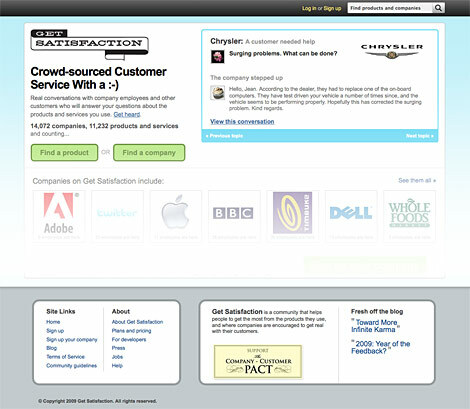 Get Satisfaction saves their header space by placing the main navigation (which is also their sitemap) in the footer. 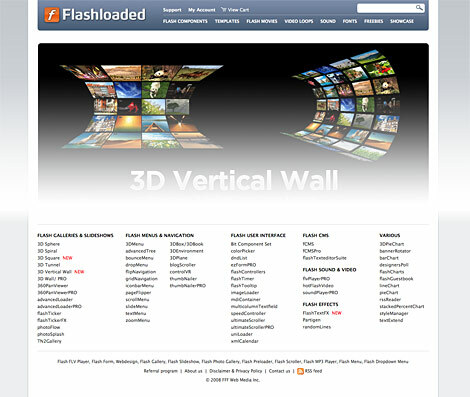 Flashloaded sells Flash components, thus their footer sitemap only lists out the products. 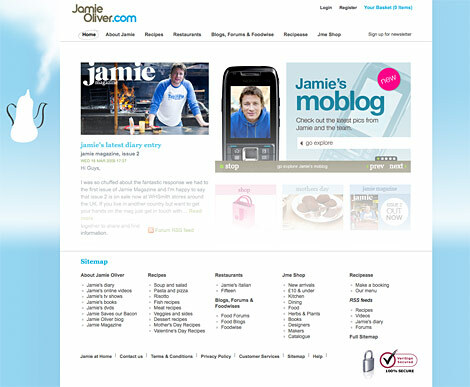 Jamie Oliver displays a simpified sitemap in the footer and also provides a link to the full sitemap. Nice and clean 5-column sitemap. I’ve been showing a lot of big corporation sites. What if you have a smaller site? 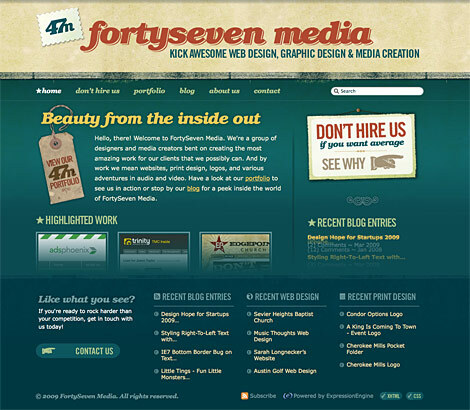 FortySeven Media is a good example of what you do with a portfolio site. 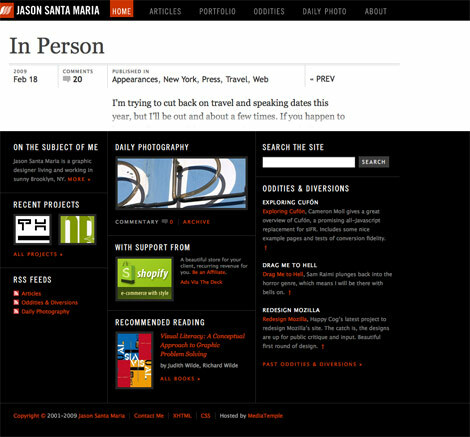 They use the footer to display the latest entries of their blog and portfolio work. This one is my favorite. Not only does it look elegant, but it also attracts readers’ attention by laying out the recent activities of the blog in a beautiful way. Categorize – organize your links in categories. Use Headings – use headings or titles for each category. Be Consistent – the order of the links should be consistent. Great Article and I think it is a good idea for the larger type of site. But the more I think about it every website could make very good use of this because you do indeed create a better user experience. I might try it on my own site as well with my main sections and my twitter feed. More great food for thought, cheers! One thing I have noticed is that some websites have huge footers with sitemaps that seem totally unnecessary, because there just isn’t enough content on the website to justify having one. If your website is small enough to be totally accessible from the top links then what is the point in having one? Nice Pages. Sitemap in the Footer is a good idea and very useful. I agree with Patrick; There is only need for a sitemap when the site is complicated. A normal portfolio-site should work without it, otherwise the basic structure of your site is messed up. A regular “work, blog, contact” should do the trick for those. Everybody knows this system, so why fill your page with extra info? I agree, if the structure of the site is complicated then we do need a sitemap, otherwise for a simple brochure site if we dont have it also, it will work! A footer sitemap is an excellent idea. Do you think this would be good for SEO too? Good post! I’m happy to read your site! Some great examples here, it’s interesting to see some sites where the “footer” is just as big as the site! And this article was well put here, many sites had been negating the footer strength, this is a simple and elegante way to rise show it up. Thanks! I’ve been pushing to update the footer in this manor on a client’s website, and this article gives great examples and support. Great post! Oh, the poor neglected footer! This is a great article. It’s a shame how much both the site map and the footer fall to the wayside on the design of a lot of sites. Great post, i’ve been thinking a lot recently about footer design for my next project. I will certainly take this into consideration. Another good example, if a little basic is the Redweb. The site structure is narrative and as you read through the site the footer ticks of the sections as you go. Bravo! Great post with show and tell. Very refreshing to see designer that champions usability…and don’t forget to include XML site map for Google and to leverage sitemap and footers to support SEO! There’s also Skype, they have a great footer too. This is really another great article and another place to look for footer inspiration. Thanks very much for sharing it with us. I always saw these but never really took into consideration their full benefit. I may try this. Great post, once again. Personally, I’ve always questioned why we have a footer. If it’s just being used as a navigation safety net, as it is in most of these examples, then the navigation isn’t working hard enough. Contact details: ok, but these should primarily appear in close proximity to the content that prompts the CTA. Legal: does the appearance of legal info in a footer carry any enforceable legal weight, over its appearance on a dedicated page? What we’re effectively doing here is adding yet another block of navigation to be processed by screen-readers and compete for attention during the all important, yet brief scan-time that websites enjoy when visitors first arrive. That’s how I’ve got mine laid out! 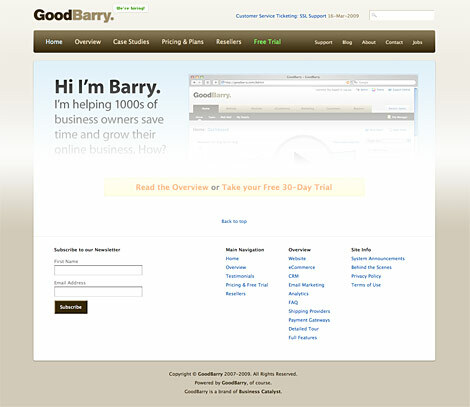 A few years back the footer was frequently used for keyword stuffing. During the evolution of Search, at one time Google and Yahoo actually favored sites that used on-page keyword stuffing and under the hood stuffing in the meta keywords tag. Now that Google has a real good handle on the stuff masters, it opened up the possibility for using the footer for intelligent design. I’ve heard the phrase “Phat Footer” or “Phat Foot” used for the latest incarnation where the footer is used for navigation and sort of a “below the fold” block. I really like a beautifully designed footer – it can look great AND it gives SEO people a chance to send the pagerank earned on the homepage directly to interior core pages that you want to pump up for more rankings. Interior links pass juice just like exterior links. I noticed this was the popular thing to do and I think it is extremely user friendly. This is an excellent round up. This sites are definitely an inspiration to me. You’re a genius… A sitemap in the footer is a better and more usefull way to catch the users atention. hmmm, but i think in the same time it should be on the top part of the page too, a lot of people just look at the top part only, they does not know even that sometimes they have to scrool down. it sound funny but it is a fact. You have done a nice analysis of web sites. Yes, that’s very true. It’s better not to have a separate page for sitemap because usually a visitor has got 0.1 chance out of a 100 possibilities of visiting the sitemap. Thus, better utilize the footer space. I guess that’s what it is meant for. Great Post!!! I really love the functional footer stuff out there now. I have also seen some really nice footer stuff with jquery sliding hidden divs for the sitemap to be revealed on click… just to make it so there is less Text… if that suits the site design anyway. YourChurch.com does this too–combined with a drop-down alphabetical listing of ministries at the top of every page–to create what is possibly the most usable church website I’ve seen. I think it’s a good idea to do it like that. This is a great post. Nice post, perfect timing.. I was just thinking of using a footer style sitemap on my personal site re-design.. Thanks! really nice post, and a great collection of some nice footers…dugg! yeah, that’s really useful. save the click. but why you dont use it at this site ? beautiful collection and great ideas..
It’s a good idea! Thanks! http://www.birminghampost.net has a smart looking sitemap footer but also has a separate sitemap page too. 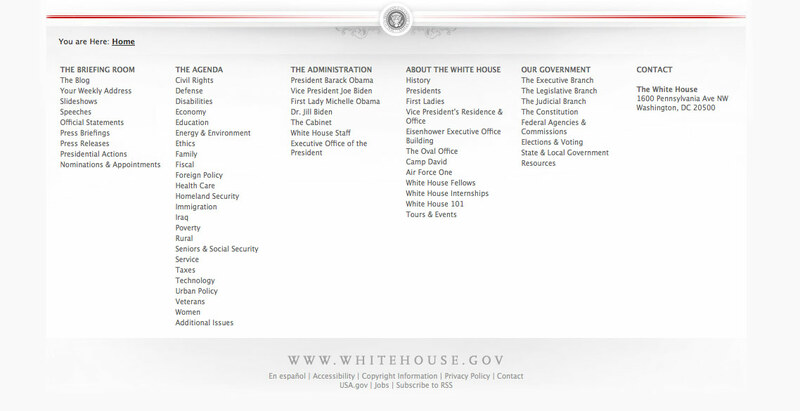 I love The White House’s footer the most. I saw it 2-3 days ago and I came to think more about footer then WDW post this. Good post I had noticed this on site and hadn’t really put much thought into in I could see it even enhancing your ranking in SEO. Will definitely consider using site map as footer on future designs, and redesigns. http://box.mepholio.com/ has a great footer inspiration section! I really need some work so if anyone needs some SEO/Marketing/Design help let me know. I’m curious, Nick (author), you don’t use a footer sitemap… how would you in this wildly fun layout YOU use, do this? All of the examples are very clean site, not really expressive though, show us your example of how you would implement this concept. As screen readers like JAWS and Window Eyes scan page content, the last thing they “see” is the footer. Placing the sitemap there positions the person using a screen reader to choose whatever is next, to navigate from that point rather than returning to a typical navigation menu near the top of the page. For the same reason, I’ve placed navigation menus in the right column of three-column layouts (with main content in the center of the page, the right column falls next in the usual order, and the footer is last). Lets not overlook the added SEO benefits – site wide interlinking. We tend to use dynamic sitemaps in our footers, use one list to link the most relevant pages in that section, then the other 2/3 columns to link the rest of the sections. Virgin Media in the UK have just redesigned their homepage and gone this route – http://www.virginmedia.com/ – a huge footer with lots of links. As a web designer I can see the benefits of using an entire sitemap in the footer from a usability point of view, However this should not detract designers from creating a clear and easy to use navigation for theiir website. Good one! This is probably one of the most useful tips that I’ve read today. Love your blogs! This is very useful info, and will be changing the ways I design my footers. Thanks for the great content. I really like the white house web site, and i like the fact that Obama isnt afraid to venture and use the digital world to reach the public. Nice design and user friendly. Come on people, find out for yourself how to best design a sitemap page. I kind of dislike these top 100 sites that all use the same design, just because the there are 99 other websites that use this technique. This makes you think less about design principles and why footers like these work. Just because they work doesn’t mean you should use them. It’s ok to invent another wheel. Great list, great SEO idea. I think Jason Santa Maria’s example is a good one- extending the content and making it useful, rather than trying to stick everything plus the kitchen sink down there. yes, it should be easy to navigate and user friendly,.. not for seo puropses. Let’s take this to a different level. Anyone have a site that uses a footer such as the one’s described that would be willing to show the google analytics click-throughs? Would be nice to some rough percentages of usage. Personally, I can’t remember 1 single moment in all my web surfing where I clicked on a footer link. I really like the idea of having a more comprehensive sitemap in the page footer. I think this is a technique that is definately catching on all around the Web. As a designer, I would have to say that the page could get a little clunky when listing a large number of links. I do, however, like the idea of only listing the pages with the most significant content. 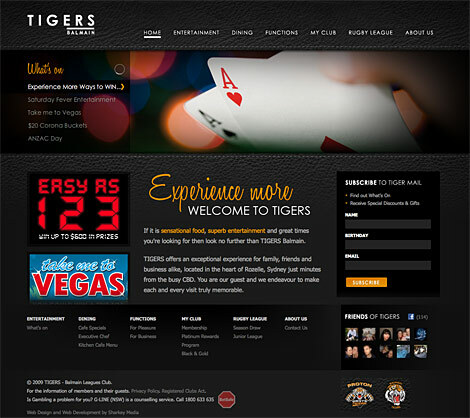 Currently, when designing websites, our company lists only the main navigation in the footer. It might be helpful to include some additional links for the purpose of user convenience. It’s definately a topic that’s worth bringing up at the next staff meeting. Thanks for the insight. Keep in mind that we found significant improvements to this approach (as in, like for like clicks typically increased), but there were also several significant negatives. One was a negative SEO impact. The other was that our users achieved goals *much* better with a thin footer. Our key learning was that it really suits some sites, and is quite detrimental on others. The post of Uxboot is also really interesting. Great article! I had done some r&d on sitemaps a little while back. I found that HP had a really awesome set-up but I havent been to their site recently. Great SEO idea, but not always fitting for every design.. perhaps if you hide the data like the comment guidelines and have it expand on click.. problem is search engines ignore anything that’s hidden I believe. As a designer, I would have to say that the page could get a little clunky when listing a large number of links. Thanks for the article. pretty useful and inspiring! Good suggestions. The expanded footer is great for usability and SEO. I like the fact that from any given page I can jump deep within another section of the site yet by putting it in the footer it doesn’t clutter the page I’m currently viewing. Not sure why you included Digg, Firefox, and Apple, but the rest are great examples for your post. Thanks a lot for the share. nice I love the collection. This is AMAZINGLY helpful, as are all the design resources here. I’ve been out of the game for a while, and it shows in my designs. Thank you for this site. Nice one, quite the inspiring post. Thanks for the information. I am in the middle of overhauling my web site so this info is greatly appreciated. Indeed I will be speaking to my web designer tomorrow about it. Its amazing how many people will still navigate a site using the site map. Some top examples of site maps here, nice stuff! Wow! I’m about to redesign the footer on the company website, this has been really helpful. Now I just have to think of a way to organize all of the footer mess. The footer is all too often overlooked in terms of web design. Thanks for bringing attention to a neglected area! Thanks for this post. You gave me some good resources, because I’m planing to design my own template so this is good inspiration. I’m definitely going to think about incrporating this into my client’s sites from now on. A footer is also very helpful for retail websites like the dutch website of hema.nl. The footer can be used to put all the categories and sub-categories in list view. This is also very SEO. Great Post. Some nice inspiration as well. Wooo, I like it. I’d noticed it before on Chris Coyier’s website, css-tricks which I really like. Great article, sourced quite a few designs there too! I’ve used this method in a couple of recent designs i have done, and in some cases it does work very nicely not only from a navigation point of view but from a content filler also if the pages of a website are a bit sparce on content. Is the traditional nav bar under threat from the footer mini-sitemap?? Whats the impact on seo of creating such a sitemap at the foot of the page that is hidden but expands on mouseover? Thank you for these rewiews. Not always simple to design a great footer. 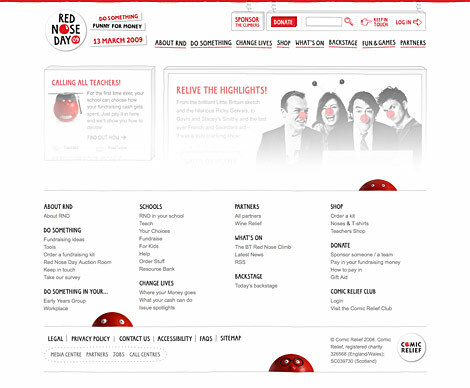 Great article, some nice inspiration as you can see already applied on redweb website. Good for seo too. A really informative articles with some great examples of sitemapped pages. Definitely going to consider using this format on some of my own sites. I do like the layout on some of these site maps. I think I will rearrange mine. Thanks for the list you provided. I really enjoyed this post and infact I have used some of the sites as inspiration for a new site we are working on. I do have a question tho……..how do you find all these sites for examples? Our church has a great sitemap in their footer as well: Church on 99. I think footers in sitemaps helps make a site a lot easier to navigate, especially when the primary navigation doesn’t have dropdown menus. It’s interesting to see sitemaps making a comeback. We have noticed some people testing their sitemap’s effectiveness recently. Mind you, it’s important to know there is a big difference between a site map and an information architecture. Great list to get inspiration. 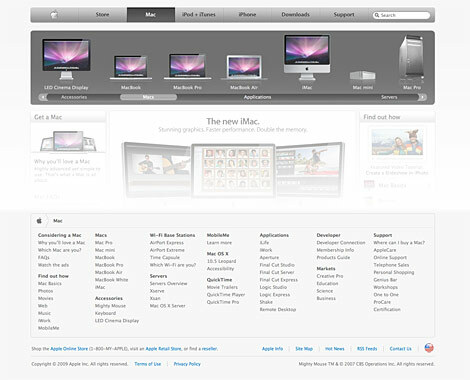 I like the breadcrumb navigation use in apple site’s footer. I like the “maximize the hover use” ;) of mozilla site’s footer. But it seems consistency is missing. Though most of the out going links (only) have arrow (on hover), some are missing. GoodBarry attempts to get subscription finally @ footer. Good Idea!, perhaps they can add a site search too. I know they have one right at the top, but visitors may give it a last try @ footer. CodeIgniter site has its documentation sitemap on the top; it is hidden by default and gets out by a click on the button called ‘Table Of Contents’. Also, microsoft’s site have a site map on the footer. I’m definitely an advocate of the mahoosive footer. It’s just nice to have all that meta sitting waiting at the bottom of each page. I generally examine footers as long as headers. very important part. Great post – really made me think! Thank you. This is exactly what I’m going to do with a project at work. Especially for long stretching pages these kind of ‘sitemap’ footers become very useful! I like the large footer myself, however i am trying to get a large footer to work with a large CSS background photo. The photo can not be infinitely long so I have a small problem. Oh well, I’ll figure it out. Great examples and some nice site designs. As the saying goes,learn as you work and work as you learn.Websites are getting more and more easy and snazzier to use and go through. What really attracts a new visitor to a site is the appearance,layout and the “feel”.As important as maintaining your physical business location.Effective layout means you are a no nonsense person and like to place things where they are most accessible from. Practicality and originality,if these two yardsticks are met then the site is worth looking into.Imperative to comment that the header footer is like the head and toes of any site.If you have them you have “your” site otherwise it is just “another” site.I liked this one. 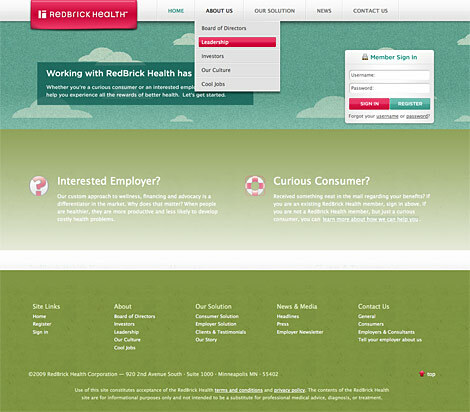 Excellent examples… very clean and intuitive approach. On the verge of revamping my entire site. This is very good information and thought provoking. Thank you for taking the time to assemble them for people like us. I’m in the process of doing this too, but I’m wondering about the SEO implications for large websites. I’ve heard that Google crawls only the first 25 or so links on a page, so if the page already has a lot of links (internal and/or external), I wonder if the footer sitemap idea might backfire a bit. Do you have any information about the SEO side of this? Thanks, and by the way I really love your site design!! Wow I really like the examples shown, some great effects here, Thanks! how would thought that larger vertical lists will sneak into footers. But it is def. easy way to fill the whitespace. Great compilation, gave me a bunch of ideas for my new themes. I think this website is a good example : http://www.avenir-sante.com/ of modern footer navigation. Hey check out the sitemap of this site. I think its pretty awesome as well. Thanks for this post – some great site map layouts shown here. Nice tips, it all makes sense, and every day more and more sites implement site map in footer. But i have some doubts about too many links in home page, because that is not seo friendly, and sitemaps often have too many links, not sure google likes that. Oi adicione pois gostei do modelo. thank you for this post!!!!!!!!!!!!! These are definitely great examples of site maps in the footer! Nice round up – I’m not sure I totaly agree with the bullet-points in the post intro though… If users are engaging through your footer, then I kinda feel you’ve not done a good enough job further up the page. I definitely see the benefit of sitemap footers if you have long pages however, where your users might become ‘stranded’ from the main site navigation (assuming this is at the top of the site). Also, I’ve always assumed that it’s great for SEO. Some great ideas for site map design. reason that i wish for enjoyment, for the reason that this this web page conations actually fastidious funny stuff too. I use sitemaps in the footer of my WordPress-themed sites. 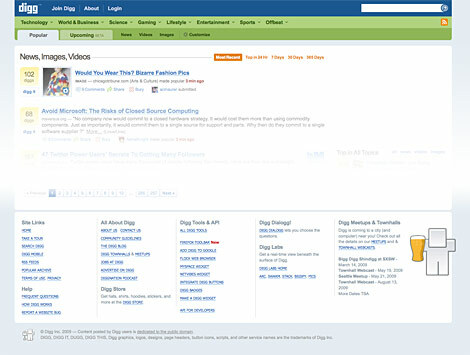 This does create its own dynamic page that will get crawled by search engines well. Those that want to look at a sitemap would view it too, but i question whether this is needed for any site other than the most over complicated sites. Good Post !!! that Answers why most websites are utilizing the footer space. Hmmm. Interesting and valuable post. Congratulation for your site. Very well written too ! would you plan to make a post on a graphical sitemap ? Thank you so much for this post, it is just what I needed to give my website footer a much needed boost and overhaul! Some great ideas. Thanks for this post! Very creative post. Thanks for sharing. These are so incredibly well thought out, I’m having such a hard time redesigning ours right now… I want to use all the ideas of inspiration, but that would mean I’d have the worlds longest footer! Thanks for sharing – I will think about using a sitemap in the footer. This is not a nice article. It’s a great article!!! This will really be highly beneficial . Thank you for creating this! Thank you. Very good Article. This was exactly what I searched for. I love this modern footers. I think I am going to subscribe to your rss feed. Regards from Germany. Nice article, very good content. Best structure is defined by Mozilla. I want to develop best HTML sitemap on website. I read entire post & assume that: HTML sitemap and footer section both are too important for users. Very useful Article for footer & Site map Designer team . Thanks for such a nice article!! Very useful..
i think that it looks more professional to have private policy, sitemap, etc in the footer. However, how do you create this in wordpress? I am missing it on your site. This is a very usefull site. This is such a great blog post! I was searching for “How to create best HTML sitemap?” on Google and land on this such a great blog post. This blog post have quite different subject from my requirement but, I suppose to indicate that suggestions will help me to design great footer with my eCommerce website. BTW: I am searching for best blog post or solution which help me to design such a great HTML sitemap and improve my indexing over Google. Can any one help me in same direction? I suppose to indicate that suggestions will help me to design great footer with my eCommerce website. Excellent post. I was checking constantly this blog and I’m impressed! Extremely useful information specially the last part :) I care for such information much. I was looking for this certain information for a very long time. Thank you and good luck. Very Help full post i really impressed. 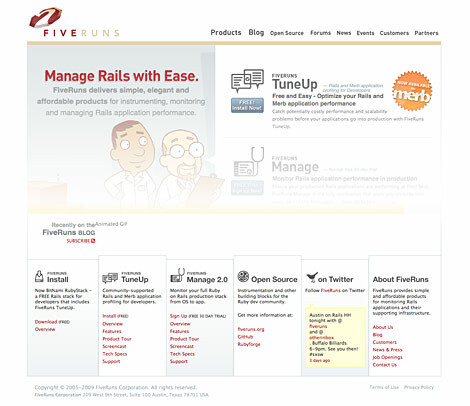 Yes I really liked the footer design of FiveRuns , I found this page through Google search when I was searching for inspiration for Footer Designs. Thanks for posting such an informative article and website collection to Inspire web designers like me . Thanks for this post. I’m just learning about sitemaps and the actual function they can play in website optimization. Would it have the same effect from an SEO perspective if I just placed a link in the footer to a page which has a sitemap? Nice, very good. Will definitely choose one of those. wonderful i like this idea thanks for sharing dude. Today I revised some of those websites, and all them changed the footer style. I come back to this site after an internet worm hole adventure. And you still post very relevant topics. I think I love you. . . . . I’ll leave now. well, this is very good post. I have personal experience of this stuff. When I started my site at that time I did not put all links at footer section after then I read somewhere and put links at footer section then simply I good good traffic. . Thanks for sharing….I am just about thinking of doing that…..
Really very nice and useful information sharing. Thanks for that. Nice point ! improved user navigation experience, and you are a “small fish” website, it is always good to follow the “leaders” experiences… I did apply this strategy on -some- of my web pages (when needed)… btw, thanks for this cool webdesigner oriented blog… keep up the good work ! Now, how do i add these into the footer? I am stuck with it.. Can anyone help..? I want to create a separate page for the HTML sitemap, does anyone have any good examples of those? They say it can give you a decent amount of internal SEO benefit by using the internal linking. I have also heard that you should place the sitemap in the upper left hand corner to ensure that the Google bot follows that link first, any thoughts? how could i see my code ? Great collections of footer design!! Totally love your blog that offering some fantastic ideas…. keep up the good work! !